Crikey, we're tearing into November now, eh? Not long until Christmas, and even fewer shopping days remaining until the big day. 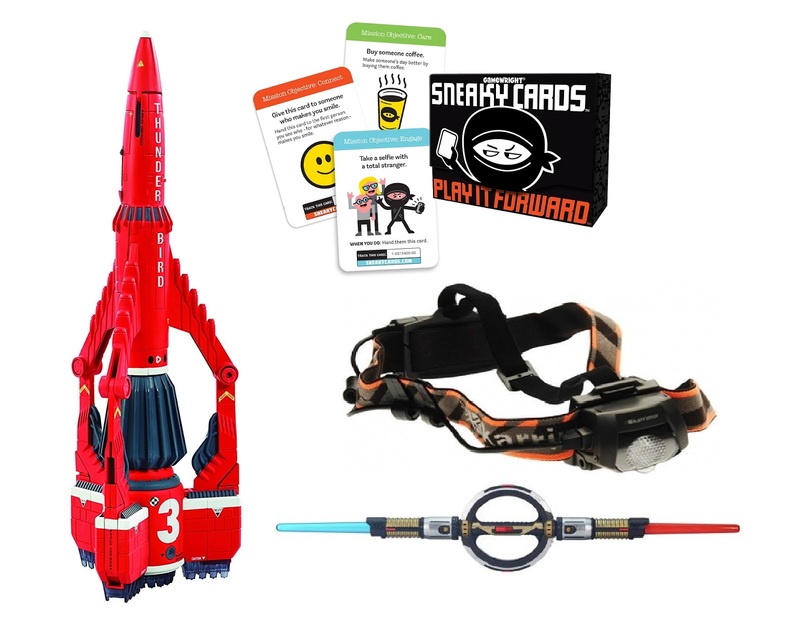 To that end we're back with another Christmas gift guide, highlighting four more awesome things that you could stuff in a stocking for someone you love. Hey, you're welcome, okay? No, not a card game to play around the dining room table over the remains of the Christmas lunch; this is in fact something you could be playing all year round. 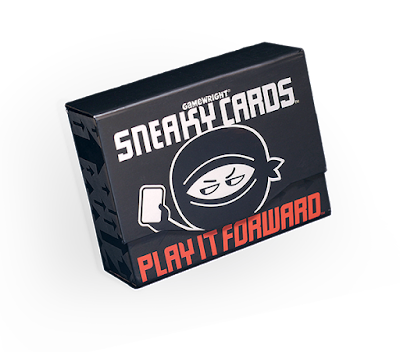 The “play it forward” idea of Sneaky Cards is that each and every card is a potential adventure, forcing you to interact with strangers, do something new and exciting, or brighten somebody's day. 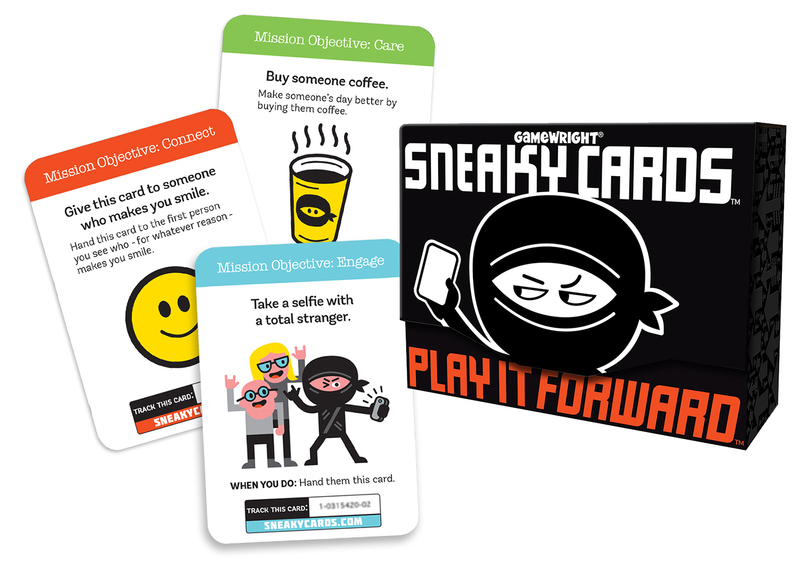 For example, a card might read “Buy a stranger a coffee”, so you have to get some random person a fresh hot coffee, and then hand over the card to them. Ideally, they'll do the same at some point, so the cards will pass from person to person, doing good. Each card also has a unique tracking number which can be entered into the Sneaky Cards website to see where it has been and what it has been involved in. The whole thing is buckets of fun and could be great fodder for inspiring interesting New Year's resolutions. See, another Star Wars product, and one we've had a tonne of fun messing about with. For those familiar with the Star Wars TV show Rebels, you might have seen the Inquisitors' spinning double-bladed lightsabers. Awesome, aren't they? Now you can create your own with this kit which includes the (battery-powered) spinning hub, and blue and red 'lightdaggers'. 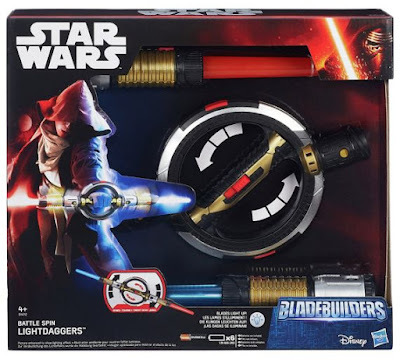 The handle actually spins, and pretty quick too, while the whole thing is compatible with other Blade Builders Star Wars products, so you can extend the length of the blades and use different colours. Still, the short blades that are included are cool, they light up, and the effect is pretty nifty. Hey... not long till Rogue One, baby! EEEEEEEKKKKKKKK! 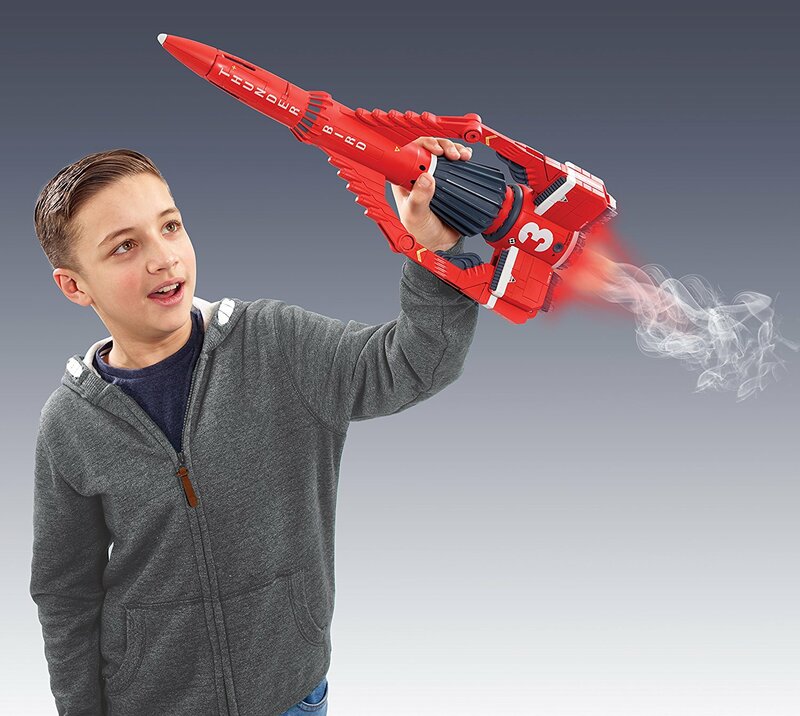 You might have seen this toy promoted about in the media as one of the most-desirable of Christmas 2016... and it's no surprise to see why. 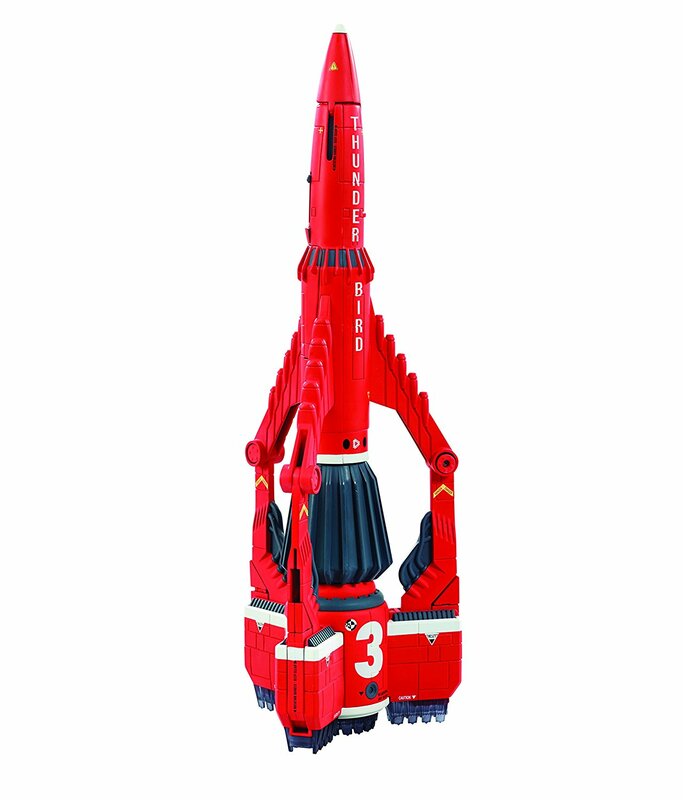 Standing half a metre tall, this spot-on replica of the rebooted Thunderbird 3 (purists calm down!) looks great just as a thing to sit on your shelf, but it actually does quite a bit. There are three modes: take off, flying, and drilling, which togther sounds like a wonderful night out to us. The most striking thing about the model is the ability for the engine exhausts to 'smoke'. When sitting ready to launch a thin cloud of vapour erupts from the engines, as well as lights glowing to mimic the burst of the thrusters. It looks pretty awesome, especially with the light glowing realistically through the smoke. After that you can fly it around the room, along with sounds taken directly from the show (“F.A.B.” etc...), then land it into drill mode. Flip out the struts to act as a tripod, and convert the cockpit to reveal a drill head, perfect for mining asteroids and the like; a wholesome Christmas activity indeed. All that, and you also get two mini figures as well; Alan and Kayo. A great set, with some fantastic effects. This Christmas, give someone the gift of light; hands free light! As we found out recently with this effort from Coleman, head lights are wonderfully useful at this time of year, and if you know someone who doesn't let a bit of early-evening darkness get the better of them, this is an ideal gift. 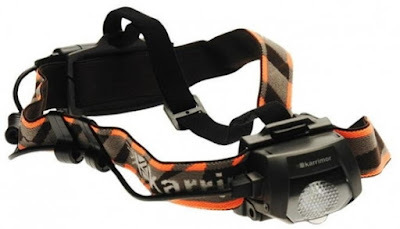 The Karrimor Ridge 280 Head light features a battery that can be recharged via USB and four levels of brightness. Because the battery pack is separate from the lamp itself, the light feels more balanced on the head, with no heavy chunk of gadgetry weighing you down on either side. It is comfortable, adjustable, and infinitely handy in these dark months; be your intended a runner, camper, or just enjoys taking out the rubbish in the dead of night. Our neighbours do that, weirdos.